For the upcoming season, see American Ninja Warrior (season 11). American Ninja Warrior (sometimes abbreviated as ANW) is an American sports entertainment competition, which is a spin-off of the Japanese television series Sasuke. It features hundreds of competitors attempting to complete series of obstacle courses of increasing difficulty in various cities across the United States, in hopes of advancing to the national finals on the Las Vegas Strip and becoming the season's "American Ninja Warrior." To date, only two competitive rock-climbers, Isaac Caldiero and Geoff Britten, have finished the course and achieved "total victory." Caldiero is the only competitor to win the cash prize. The series premiered on December 12, 2009, on the defunct cable channel G4, and airs now on NBC with encore episodes showing on USA Network, NBCSN, and Esquire Network. 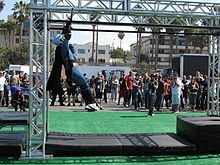 An American Ninja Challenge competitor in a Batman costume. In late 2006, the American cable channel G4 began airing broadcasts (subtitled in English or dubbed with English commentary and re-titled Ninja Warrior) of the Japanese sports entertainment television special Sasuke. To coincide with this, the channel held the first ever American Ninja Challenge, in which Americans gained the opportunity to be sent to compete on Sasuke. Over time, the semi-annual Sasuke broadcasts on G4 gained a cult following in the United States and eventually became some of the channel's most-watched broadcasts. This led to the creation of the American adaptation of the show, American Ninja Warrior, in 2009. As a result, American Ninja Warrior succeeded American Ninja Challenge as the qualifying route for Americans to enter Sasuke. Since the fourth season, American finalists compete on a nearly-identical finals course on the Las Vegas Strip rather than traveling to Japan to compete on Sasuke. NBC began broadcasting the city finals and national finals episodes in the fourth season. By the fifth season, G4 was set to be replaced by Esquire Network and had wound down all original programming—besides American Ninja Warrior—by January 2013. Notably, the sideboard advertising along the fifth season's courses listed Esquire Network as the broadcaster because G4 was going to transition into Esquire Network by April 22, 2013—prior to the season premiere. However, the channel switch was delayed to September 23, 2013, and Esquire Network took over Style Network's channel space instead. As a result, NBC became the sole broadcaster of the original episodes while Esquire Network aired reruns until the eighth season. Indicates competitor(s) completed Stage 4 and won the title of "American Ninja Warrior." The broadcast position for host Matt Iseman and co-host Akbar Gbaja-Biamila, seen here in the eighth season alongside a city course. During each episode, the host and co-host provide play-by-play on a competitor's run on the course while the sideline reporter introduces the obstacles and interviews competitors. American Ninja Warrior was originally hosted by G4 television personality Blair Herter and television correspondent Alison Haislip. In the second season, comedian and television host Matt Iseman joined the show, replacing Herter. Producers were fond of his knowledge of sports and lighthearted, enthusiastic delivery. Additionally, MMA fighter Jimmy Smith was brought in as co-host while Haislip was assigned to the new sideline reporter position. The panel remained the same throughout season three. For season four, Olympic medalist Jonny Moseley was brought in as the new co-host, replacing Smith. Producers believed his experience as a freestyle skier would bring a unique perspective to the series. Meanwhile, sportscaster and television presenter Angela Sun replaced Haislip. For season five, two newcomers were introduced. Sports analyst and former NFL player Akbar Gbaja-Biamila replaced Moseley, while ESPN sportscaster and model Jenn Brown replaced Sun as sideline reporter. Gbaja-Biamila was contacted to audition for the role of co-host in Los Angeles after being seen on the NFL Network by one of the series' executive producers. The season five panel remained the same through the sixth season. For season seven, CBS Sports reporter Kristine Leahy joined the show as the new sideline reporter, replacing Brown. Iseman and Gbaja-Biamila will return to host the eleventh season along with new sideline reporter Zuri Hall. Before being eligible to compete, all contestants must first meet a number of requirements. Some of the requirements are; (1). Contestants must be legal residents of the United States. (2).Contestants must be in decent physical shape. (3). There is no maximum age limit, but contestants must be at least 19 years of age (21 years old during the first nine seasons). (4). Contestants must fill out a 20-page questionnaire and make a video about themselves. Video length requirements have varied from two to eight minutes, depending on the season. About 1,000 people applied to compete in the first season, 3,500 in the fifth season, 5,000 in the sixth season, 50,000 in the seventh season, 70,000 in the eighth season, and 77,000 in the ninth season. Producers then select 100 contestants from the thousands of applicants to participate in each regional qualifier. They also select 20 to 30 "walk-ons" who may wait weeks camping outside a course to compete on it. Some have noted that the program is a game show and not a traditional athletic competition. Four-time ANW contestant Travis Brewer said, "If you do well on the first night but not on the second, your results aren't averaged out. You don't move on," adding, "There's no point system. And they choose people who have a good story as much as ability." City qualifier and finals courses are filmed back-to-back, usually over two nights. Indianapolis city qualifier entrance during the eighth season. In each city qualifier course, the competitors that the producers have selected compete on an obstacle course consisting of six obstacles. At the beginning of each run, a buzzer sounds off and a timer begins, allowing a competitor to start the course. The first obstacle on any city qualifying course is the quintuple steps or floating steps, which competitors must run across. This is followed by four different obstacles that test a competitor's balance, upper-body strength, and grip. These five obstacles are built above water. If a competitor falls into the water or touches it, their run ends immediately and the timer records their time. Until the ninth season, the sixth and final obstacle was the 14'6" warped wall, in which competitors were given three chances to reach the top. In the tenth season, the 18-foot "Mega Wall" was introduced adjacent to the warped wall. Competitors have only one attempt to reach the top of the Mega Wall and, if successful, they win $10,000. If unsuccessful, the competitor only gets one attempt at the warped wall. Competitors are given the choice of which to climb. At the top of both walls, a competitor presses a buzzer that stops the timer and records their time, ending their run on the course. The top 30 competitors who go the farthest in the least amount of time advance to the city finals course. Since the ninth season, the top five women also advance to the city finals, regardless of whether they finished in the top 30. City finals courses are the follow-up to each city qualifying course. They contain four new obstacles in addition to the six obstacles featured in the city qualifying course. These four obstacles are all placed after the original six obstacles. As of the tenth season, two of the original six obstacles are replaced with new obstacles for the city finals course. The top 15 competitors who go the farthest in the least amount of time from each city finals course move on to compete on the National Finals course. As of the ninth season, the top two women in each city finals course also move on to compete on the National Finals course, even if they do not finish in the top 15. Previously, many women had been granted "wildcard" slots, which allowed them to advance to the National Finals. Since the eighth season, small prizes ranging from $1,000 to $5,000 are awarded to first, second, and third finishers who complete the city finals course. In the first three seasons, there was a semi-finals course in between the city finals and the National Finals courses, where the top 15 competitors from the city finals course were narrowed down to 10 and then sent to Japan to compete on Sasuke. In the second and third seasons, this was referred to as "boot camp" and took place at a summer camp in Simi Valley, California. During this time, competitors trained together for multiple days and took part in pressure challenges. With the expansion of the series in its fourth season, there was no longer a need to narrow down competitors to 10, as they were no longer being sent to Japan, and this semi-finals course was removed. Location of city qualifying and finals courses from seasons 1–11. The final obstacle of all city courses, the Warped Wall, seen here in Indianapolis when the course was curved around Monument Circle. Obstacles are designed and produced in the five months prior to an episode taping. In the fourth season, each location contained one or two obstacles that differed between other locations. Since the fifth season, three to five obstacles have differed. In the eighth season, 18 obstacles were debuted. In the tenth season, the show's first underwater obstacle was introduced during Stage 2 of the National Finals. Beginning with the ninth season, fans of the show have been given the opportunity to design their own obstacles through the ANW Obstacle Design Challenge. Seven fan-submitted obstacles have been featured on the series thus far. In the first three seasons, the top 10 ANW competitors advanced to a Sasuke finals course in Japan. Since season four, ANW has had a finals course on the Las Vegas Strip known as "Mount Midoriyama." The National Finals course consists of four stages, each containing obstacles of increasing difficulty. The course is about the same size as four football fields and contains 23 obstacles. Stage 1 consists of eight obstacles, which test the competitors' agility and speed. The first stage is timed, and only the competitors who successfully complete it within two minutes and 35 seconds advance to Stage 2. Stage 2 contains six obstacles that test competitors' strength and speed. Competitors must complete the course within a time limit in order to advance to Stage 3. The time limit from the first through ninth seasons was four minutes. In the tenth season, the time limit was increased by 30 seconds. Stage 3 consists of eight obstacles that test competitors' upper body and grip strength. It is the only stage in the National Finals that has no time limit. Like Stages 1 and 2, only the competitors who successfully complete Stage 3 move on to compete on Stage 4. Stage 4 contains the final obstacle of the National Finals courses—a rope climb. Competitors must complete this rope climb in 30 seconds or less in order to be crowned as "American Ninja Warrior." The rope climb's height was 50 feet from the first through third seasons, and was increased to 65 feet in the fourth season. It has been increased since to 75 feet. Aside from the first season, if a competitor completes all four stages of the National Finals, he or she receives a cash prize. In the second season, the prize money was $250,000. In the third season, the prize was an endorsement deal with K-Swiss worth $500,000 and to become the face of a national advertisement campaign for the company as well as G4. In the fourth, fifth, and sixth seasons, the cash prize was $500,000. Since the seventh season, the cash prize has been $1,000,000. From the second through seventh seasons, the fastest competitor would receive the full prize money, regardless of whether other competitors completed Stage 4 as well. Beginning with the eighth season, if multiple competitors completed Stage 4, the competitors split the prize money. Since the tenth season, the "Last Ninja Standing," the competitor who would go the farthest in the least amount of time in the National Finals, if no other competitor completed Stage 4 first, would win $100,000. The first season of American Ninja Warrior began production in July 2009. The season premiered on December 12, 2009, on G4, and concluded on December 19, 2009. It consisted of eight half-hour episodes. 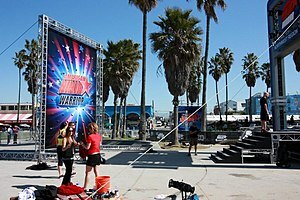 The qualifying round took place on the beach in Venice, Los Angeles, where a tryout was opened, meaning, competitors from across the United States had to fly themselves there to compete. Levi Meeuwenberg was the Last Ninja Standing, having gone the farthest in the least amount of time among the American competitors on Sasuke 23. The second season premiered on December 8, 2010, on G4, and concluded on December 23, 2010, after 10 hour-long episodes. Qualifiers were held in Venice, Los Angeles in August. Out of the 10 competitors sent to Japan to compete on Sasuke 26, five completed Stage 1, four completed Stage 2, while none completed Stage 3. David Campbell was the Last Ninja Standing, having been the American gone the farthest in the least amount of time on Stage 3. The third season had the same format as the second season but aired in the summer. Qualifiers were held in Venice, Los Angeles in May. It premiered on July 31, 2011, on G4, and concluded on August 21, 2011. The finale was aired again on August 22, 2011, as a two-hour primetime special on NBC. In addition to the 10 Americans sent to compete on Sasuke, one fan of ANW got the chance to compete as well. This was the result of an eBay auction in which proceeds were sent to the American Red Cross to help with recovery efforts following the 2011 Tōhoku earthquake and tsunami in Japan. During Sasuke 27, four of the six competitors who reached Stage 3 were American—a new record. Previously, only one American would reach Stage 3 per Sasuke competition. David Campbell was again the Last Ninja Standing, having gone the farthest tin the least amount of time among the American competitors on Stage 3. Filming at the entrance of the Venice, Los Angeles course during the fourth season. 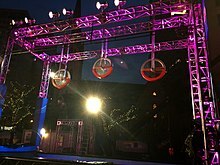 The fourth season was notable for differentiating American Ninja Warrior from Sasuke and began what is known as "the modern era" of the series. Following the ratings success of the third season's NBC primetime special, the fourth season aired on both G4 and NBC. It premiered on May 20, 2012, on G4, and concluded on July 23, 2012, on NBC. City qualifier courses and the first half of the National Finals were aired on G4, while the city finals courses and the second half of the National Finals aired on NBC. With an increased production budget, preliminary rounds were held in three different locations across the United States. In addition to Venice, Los Angeles, six regional qualifier competitions (Northeast, Northwest, Midwest, Midsouth, Southeast, and Southwest) took place in Dallas and Miami. During the National Finals, which were held for the first time in the United States, Brent Steffensen was the only competitor to reach Stage 3 and became the Last Ninja Standing. He went further on Stage 3 than any American had ever gone before—including on Sasuke. The fifth season premiered on June 30, 2013, on G4, and concluded on September 16, 2013, on NBC. City qualifiers and finals courses aired on both G4 and NBC. Regional competitions were held in four different locations: Venice, Los Angeles, Baltimore, Miami, and Denver. In the Los Angeles qualifier, Jessie Graff became the first woman to qualify for a city finals course. During the National Finals, 41-year-old Joyce Shahboz became the first woman to compete there twice in two years (as a wild card), while Brian Arnold fell on the final obstacle of Stage 3 and won the title of Last Ninja Standing. The sixth season premiered on May 26, 2014, and concluded on September 8, 2014, with original episodes airing solely on NBC. Regional competitions were held in Venice, Los Angeles, Dallas, St. Louis, Miami, and Denver. In the Dallas qualifier, Kacy Catanzaro became the first female competitor to make it up the Warped Wall. Later in the Dallas finals, she became the first woman to complete a city finals course. Catanzaro's two runs have been described as the first "viral moment" of the show and are credited with increasing the seventh season's submissions ten times over. During the National Finals, Joe Moravsky fell on the antepenultimate obstacle of Stage 3 and became the sixth season's Last Ninja Standing. The seventh season premiered on May 25, 2015, and ended on September 14, 2015. Regional competitions were held in six different locations, including two in Los Angeles. In addition to the Venice course, a special military-only course was built in San Pedro. Regional competitions were also held in Kansas City, Houston, Orlando, and Pittsburgh. During Stage 3 of the National Finals, two competitors, Isaac Caldiero and Geoff Britten, completed the course and advanced to Stage 4, marking the first time any competitor(s) completed Stage 3. During Stage 4, Britten completed the rope climb in 29.65 seconds out of a maximum of 30 seconds while Caldiero completed the rope climb in 26.14 seconds out of a maximum of 30 seconds. As Caldiero completed Stage 4 faster than Britten, he was awarded the full prize money and Britten received nothing, though Britten became the first competitor to complete all six courses (city qualifier, city finals, and four stages of the National Finals) in a single season. The Fly Wheels, the third obstacle on the Indianapolis city course in the eighth season. The eighth season of the series began on June 1, 2016, and concluded on September 12, 2016. The eighth season marked a 40 percent increase in the number of female submission videos from the previous season. Regional competitions were held in Venice, Los Angeles, Atlanta, Indianapolis, Oklahoma City, and Philadelphia. During the Philadelphia finals, no competitor completed the course—a first in the series' history. In Stage 1 of the National Finals, many "veterans" of the show, including Geoff Britten, did not complete the course. As a result, only 17 competitors advanced to Stage 2—the lowest in the series' history. However, Jessie Graff became the first woman to complete Stage 1, placing fifth. On Stage 3, Drew Drechsel fell during his run and became the Last Ninja Standing. The ninth season premiered on June 12, 2017, and ended on September 18, 2017. 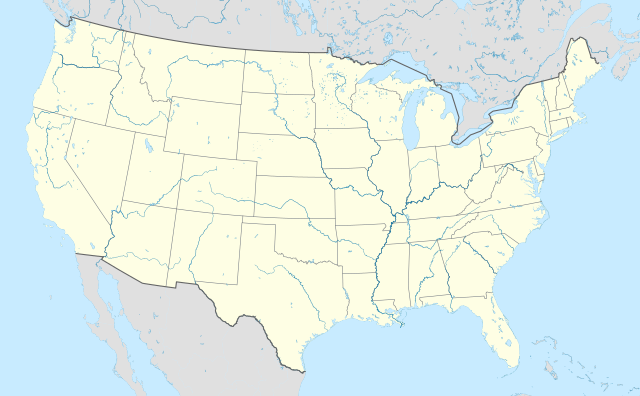 Qualifiers were held in Universal City, Denver, Kansas City, San Antonio, Daytona Beach, and Cleveland. A record of 41 competitors successfully completed Stage 1 during the National Finals, including Allyssa Beird, who became just the second woman to complete it. Stage 2 saw every competitor eliminated less Joe Moravsky, Sean Bryan, and Najee Richardson. However, none would go on to complete Stage 3. Bryan and Richardson fell on the Ultimate Cliffhanger, while Moravsky fell on the penultimate obstacle and became the Last Ninja Standing. The tenth season began airing on May 30, 2018, and ended on September 10, 2018. City qualifier and finals competitions were held in Universal City, Dallas, Miami, Indianapolis, Philadelphia, and Minneapolis. Drew Drechsel and Sean Bryan—the two competitors to reach Stage 3 of the National Finals—both fell during their runs. However, Drechsel fell at a faster time than Bryan, crowning him the Last Ninja Standing. As the result of a format change introduced this season, Drechsel was also the first Last Ninja Standing to win $100,000 for being the competitor who went the farthest in the least amount of time on the National Finals course but did not complete Stage 4. The eleventh season will premiere on May 29, 2019. City qualifier and finals competitions are to be held in Universal City, Atlanta, Oklahoma City, Baltimore, Cincinnati, and Tacoma, marking the first time that a course will be held in the Pacific Northwest. Meanwhile, the National Finals will return to Las Vegas for the eighth year. New rules regarding the Mega Wall obstacle, which was introduced in the previous season, are set to come into effect as well. NBC has aired a series of six specials in which ANW fan favorites compete in a team against teams of competitors from regions across the world, including Japan, Europe, Latin America, and most recently, Asia. The competitors race on the same course used in the ANW finals. All of the specials have been hosted by Matt Iseman and Akbar Gbaja-Biamila. The first two included sideline reporter Jenn Brown. Since the 2016 special, Kristine Leahy has sideline reported. The first special was called USA vs. Japan, while the rest were named USA vs. The World. The inaugural competition was aired on January 13, 2014, and was won by Team USA. The second special aired on September 15, 2014, and was won by Team Europe. The third special aired on January 31, 2016, and was won by Team USA. The fourth international competition was aired on June 4, 2017, and was again won by Team USA. The next special aired on March 11, 2018, and was won by Team Europe. The sixth competition aired on January 27, 2019. It featured competitors from the United States, Europe, and for the first time, Australia. For the first time, each team had at least one female competitor. On May 29, 2016, prior to the premiere of season eight, NBC aired a two-hour all-star special in which hosts Matt Iseman and Akbar Gbaja-Biamila chose their own all-star teams composed of three veterans, one rookie, and one woman. Teams competed on stages two, three, and four of the regular season finals course, Mt. Midoriyama, as well as competitions on a supersized course that tested their skills in competitions on the giant pegboard, 40-foot Salmon Ladder, Flying Shelf Grab, and Jump Hang, concluding with a race to the top of the "Mega" Warped Wall. The all-star winners were Team Akbar, who won the team competition by beating Team Matt 5-3. Joe Moravsky completed Stage 2 in a record time of 1:08:52. On February 20, 2017, NBC aired a second two-hour all-star special. Like the previous year's competition, ANW hosts Matt Iseman and Akbar Gbaja-Biamila chose their own all-star teams, this year composed of one veteran, one breakout star, and one woman. Team Matt featured Chris Wilczewski, Najee Richardson, and Jesse "Flex" Lebreck. Team Akbar featured Grant McCartney, Neil "Crazy" Craver, and Meagan Martin. Sideline interviewer Kristine Leahy picked her team, which consisted of Jessie Graff, Flip Rodriguez, and Nicholas Coolridge. Teams competed in a relay race to finish sections of stages one, two, and three of the regular season finals course, Mt. Midoriyama. Next came the skills competition on a supersized course, where contestants tested their skills in competition on the 75-feet tall Endless Invisible Ladder, the 4-story high Super Salmon Ladder, Supersonic Shelf Grab, Striding Steps, and the Mega Wall, now 20 feet high. The all-star winners were Team Kristine, who won the team relay race competition, beating Team Matt and last year's champions Team Akbar. Their highlight of the night was completing Stage 3 in a record time of 5:30:62, making this the POM Wonderful Run of the Night. On May 17, 2018, NBC aired a third two-hour all-star special. Like the last two seasons' competition, ANW hosts Matt Iseman and Akbar Gbaja-Biamila, along with Kristine Leahy, chose their all-star teams composed of two male veterans and one female veteran. The reigning champs, Team Kristine (gray/pink), featured: Jessie Graff, Flip Rodriguez, and J. J. Woods. Team Matt (blue) featured: Jamie Rahn, Lance Pekus, and Jesse LaBreck. Team Akbar featured first-time all-stars: Allyssa Beird, Jon Alexis Jr., and Tyler Yamauchi. For the first half of the special, the athletes competed individually, earning "skills medals". First was the "Skills Competition", which consisted of climbing the Super Salmon Ladder, 4 stories high and 35 rungs in the fastest time. Sean Bryan was the winner with a time of 19.39. The second skill medal was the Wicked Wingnuts obstacle. Drew Drechsel was the winner with a distance of 20 feet. Third, Upper body strength was tested on the Thunderbolt won by Jamie Rahn. Fourth, a speed and balance challenge on the Striding Steps was won by Jake Murray with a time of 28.76. Finally, in a new obstacle, the Mega Spider Climb, eight women all-stars raced side-by-side 80 feet up to the top of the Stage 4 tower. The competition was won by Jessie Graff in a time of 24:03, for the POM Wonderful Run of the Night. The second half showcased the team competition: Stage 1 featured a relay race through the obstacles course. The first racer goes through Snake Run, Propeller Bar, and Double Dipper. The next racer tackles the Jumping Spider, Parkour Run, and the Warped Wall. The anchor runs through the Domino Pipes and the Flying Squirrel. The remaining two teams compete on Stage 2 for the other spot in the finals. Team Kristine won Stage 1 and a bye to Stage 3. Stage 2 featured the Giant Ring Swing, Criss Cross Salmon Ladder, Wave Runner, Swing Surfer, Wingnut Alley and the Wall Flip. Team Matt won and moved to Stage 3, which featured Floating Boards, Key Lock Hang, the Nail Clipper, Ultimate Cliffhanger, the Body Prop, Peg Cloud, the Time Bomb and the Floating Bar. Team Kristine won the overall competition and the team relay race with a time of 6:12.06, beating Team Matt by only 5 seconds (6:17.96). 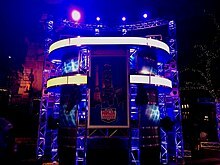 Celebrity Ninja Warrior is a special episode of ANW where celebrities compete on a modified American Ninja Warrior course and are coached by ANW competitors. The special aired as part of Red Nose Day, with money raised during the event donated to Comic Relief USA. Matt Iseman and Akbar Gbaja-Biamila hosted both editions alongside ANW sideline reporter Kristine Leahy. The first special aired on May 25, 2017. Nine celebrities competed. For every obstacle the celebrities completed, M&M's and The Rockefeller Foundation pledged to donate $5,000. The second special aired on May 24, 2018. Each obstacle a celebrity completed raised $5,000 for Red Nose Day; earning up to $30,000 for finishing the whole course. A total of $185,000 was raised, courtesy of Comcast. In Australia and New Zealand, the show is broadcast on SBS2 (2013–2017), 9Go! (2018), TV3 and Four. On April 25, 2016, it was announced that Canadian broadcaster CTV picked up American Ninja Warrior for its 2016 summer broadcast schedule . In the United Kingdom and Ireland, the show is broadcast on Challenge. In Israel, the show is broadcast on Yes Action and Keshet 12. In 2016, Croatian RTL started broadcasting the show. The show is also shown in Finland on Sub-TV. In the Netherlands the show was first broadcast in 2017 on SBS 6, where their own Ninja Warrior NL has been broadcast. The show is in syndication markets throughout the US and airs on local broadcast channels. As of August 18, 2018, the syndicated episodes are airing on MTV2 on Saturdays. On October 9, 2015, Esquire Network announced a spin-off of American Ninja Warrior, which would feature 24 three-person teams (two men and one women) of popular ANW alumni, initially titled Team Ninja Warrior. The teams compete head-to-head against each other, running the course simultaneously, thus creating a new live duel dynamic (including crossing points, where the two competitors can affect the other's progress.) The two teams with the fastest times advance to the finale, where one team will be crowned the winner and receive a cash prize. Matt Iseman and Akbar Gbaja-Biamila host alongside actor and journalist, Alex Curry. The series is Esquire Network's most-watched program in the channel's history. On May 31, 2016, Esquire Network ordered a sixteen-episode second season that also included a five-episode special college edition that had college-aged competitors go head-to-head against rival schools. On March 6, 2017, it was announced that Team Ninja Warrior will be moving to sibling cable channel USA Network as Esquire Network winds down its linear channel operations and relaunches as an online only service. The show's second season premiered proper on April 18. Ahead of its third season, the show was also re-titled American Ninja Warrior: Ninja vs. Ninja. On May 2, 2018, the second spin-off of American Ninja Warrior—entitled American Ninja Warrior Junior— was announced. Set to premiere on Universal Kids on October 13, 2018, Matt Iseman and Akbar Gbaja-Biamila will reprise their roles from ANW as hosts, with Olympic 2016 gold medalist Laurie Hernandez joining as co-host, guiding competitors in head-to-head challenges. The series will feature 200 kids ages 9–14 competing along a course of miniature, kid-friendly ANW obstacles such as the warped wall. Similar to ANW, males and females will run along the same course, and similarly to Ninja vs. Ninja and College Madness, competitors compete head-to-head. However, they will be divided into three age groups: 9–10, 11–12 and 13–14, with each category coached by fan-favorite athletes: Drew Dreschel, Kevin Bull, Natalie Duran, Meagan Martin, Najee Richardson, and Barclay Stockett. A video game based on the series, American Ninja Warrior Challenge, was released on multiple consoles on March 19, 2019. The game includes online multiplayer, career mode, course and character customization, and all of the elements taken from the show with in-game commentary by Iseman and Gbaja-Biamila. ^ The prize was an endorsement deal with K-Swiss worth $500,000. ^ Geoff Britten completed Stage 4 in 29.65 seconds out of a maximum of 30 seconds while Isaac Caldiero completed Stage 4 in 26.14 seconds out of a maximum 30 seconds. As Caldiero completed Stage 4 faster than Britten, he was awarded the full prize money and Britten received nothing. ^ 2018 Creative Arts Emmy Awards nominees for "Outstanding Picture Editing for a Structured or Competition Reality Program": Nick Gagnon, David Greene, Michael Kalbron, Corey Ziemniak, Curtis Pierce, Kyle Barr, Mary Dechambres, Matthew Probst, Scott Simmons, Martin Singer, Katherine Griffin, Flavyn Mendoza. ^ 28th Producers Guild of America Awards nominees for "Outstanding Producer of Competition Television": Arthur Smith, Kent Weed, Anthony Storm, Brian Richardson, Kristen Stabile, David Markus, J.D. Pruess, D. Max Poris, Zayna Abi-Hashim, Royce Toni, John Gunn, Matt Silverberg, Briana Vowels, Mason Funk, Jonathan Provost. ^ 29th Producers Guild of America Awards nominees for "Outstanding Producer of Competition Television": Arthur Smith, Kent Weed, Anthony Storm, Brian Richardson, Kristen Stabile, David Markus, Royce Toni, Stephen Saylor, J.D. Pruess, Jeffrey J. Hyman, D. Max Poris, Briana Vowels, and Jonathan Provost. ^ Lee, Nikki (October 5, 2017). "Director Patrick McManus on creating the pieces of the American Ninja Warrior puzzle". American NInja Warrior Nation. Retrieved August 6, 2018. ^ a b c "American Ninja Warrior (Titles & Air Dates Guide)". epguides. January 10, 2019. Retrieved January 21, 2019. ^ a b c d "G4 Announces New Competition Series "American Ninja Warrior," Taking America's Top 10 Competitors to Japan to Take on the World Famous Sasuke Obstacle Course". The Futon Critic. July 29, 2009. Retrieved January 19, 2019. ^ a b c d "G4 Announces Season Two of "American Ninja Warrior"". The Futon Critic. July 26, 2010. Retrieved January 19, 2009. ^ a b "NBC Announces Three New and Returning Series Premieres for Summer 2012 Schedule". The Futon Critic. March 15, 2012. Retrieved January 21, 2019. ^ a b c d e f g h i j k l m n o Lee, Nikki (May 30, 2018). "The evolution of American Ninja Warrior: Seasons 1-4". American Ninja Warrior Nation. SB Nation. Retrieved January 19, 2019. ^ a b Petski, Denise (February 14, 2019). "'American Ninja Warrior' Renewed For Season 8 By NBC". Deadline Hollywood. Retrieved February 14, 2019. ^ "Esquire Network Brings the Classic Japanese Hit "Ninja Warrior" Back to the Small Screen". The Futon Critic. August 3, 2016. Retrieved January 19, 2019. ^ a b Hale, Mike (August 21, 2011). "A 'Ninja Warrior' Upgrade Into Network Prime Time". The New York Times. Archived from the original on June 12, 2018. ^ Stuever, Hank (July 20, 2012). "'American Ninja Warrior': A tribute to strength and, most of all, failure". The Washington Post. Retrieved January 20, 2019. ^ "American Ninja Warrior Season 5 - Baltimore Qualifiers, Mike Bernardo". June 8, 2016. Retrieved January 26, 2019. ^ a b c d e f Lee, Nikki (May 30, 2018). "The evolution of American Ninja Warrior: Seasons 5-7". American Ninja Warrior Nation. SB Nation. Retrieved January 19, 2019. ^ a b c "NBC's "American Ninja Warrior" Makes History with First Winner". The Futon Critic. September 14, 2015. Retrieved January 30, 2019. ^ a b c d e "G4 and NBC Premiere New Season of "American Ninja Warrior," the World's Most Difficult and Action-Packed Obstacle Course Competition Series". The Futon Critic. April 11, 2012. Retrieved January 19, 2019. ^ a b c "G4 Brings Fans the Biggest and Most Daring "Ninja Warrior" Event in the Network's History with "American Ninja Warrior"". The Futon Critic. November 30, 2009. Retrieved January 19, 2009. ^ Estrin, Joshua (November 26, 2013). "Matt Iseman "American Ninja Warrior" Says: It Shouldn't Hurt To Laugh". HuffPost. Retrieved January 21, 2019. ^ a b "G4 Ups the Action in New Season of "American Ninja Warrior" With More Intense Competition, A Live-In Elimination Boot Camp and A $250,000 Prize". The Futon Critic. November 4, 2010. Retrieved January 19, 2019. ^ a b c "G4 and NBC Team Up to Give Fans the Most Action-Packed Event of the Summer With Season Three of G4's Hit Series "American Ninja Warrior"". The Futon Critic. June 30, 2011. Retrieved January 19, 2019. ^ Hibberd, James (April 8, 2013). "'American Ninja Warrior' returning with new hosts". Entertainment Weekly. Retrieved October 24, 2015. ^ Former SDSU Football Star, And New Host of American Ninja Warrior Akbar Gbaja-Biamila Joined Scott & BR!. mighty1090.com (Radio broadcast). January 31, 2019. Retrieved February 1, 2019. ^ Lesley Goldberg (2015-03-12). "'American Ninja Warrior' Taps New Co-Host for Season 7. (Exclusive)". Hollywood Reporter. Retrieved 2015-09-27. ^ "NBC Announces Summer Premiere Dates for "America's Got Talent" and "American Ninja Warrior"". The Futon Critic. March 5, 2019. Retrieved March 5, 2019. ^ "The Conversation: 'American Ninja Warrior' Geoff Britten on winning the game show". Washington Times. Retrieved 2015-09-27. ^ Alex Garofalo (2014-09-12). "'American Ninja Warrior' Tryouts 2015: How To Get Cast On Season 7". Ibtimes.com. Retrieved 2015-09-27. ^ a b c Bryant, Kelly (June 2, 2016). "9 Fierce Facts About American Ninja Warrior". Mental Floss. Minute Media. Retrieved February 12, 2019. ^ a b Prokos, Katrina (October 7, 2013). "Gainesville Resident Takes On New Name: American Ninja Warrior". WUFT. Retrieved January 21, 2019. ^ Chapin, Adele (August 28, 2015). "Why Does Everyone Want to Become an American Ninja Warrior?". racked.com. Retrieved September 18, 2016. ^ "'If It Were Easy, It Wouldn't Be Interesting,' Say 'Ninja Warrior' Producers". NPR. June 23, 2016. Retrieved August 7, 2018. ^ Lee, Nikki (March 21, 2017). "American Ninja Warrior producers and hosts discuss the show's exponential growth". American Ninja Warrior Nation. Retrieved August 6, 2018. ^ Kunitz, Daniel (2016). Lift: Fitness Culture, from Naked Greeks and Dumbbells to Jazzercise and Ninja Warriors (First ed.). 195 Broadway, New York, NY 10007: HarperCollins Publishers. p. 197. ISBN 9780062336187. ^ a b Lee, Nikki (January 10, 2017). "The fine points of American Ninja Warrior course evolution". American Ninja Warrior Nation. Retrieved August 5, 2018. ^ a b c d e Lee, Nikki (May 30, 2018). "The evolution of American Ninja Warrior: Seasons 8-10". American Ninja Warrior Nation. SB Nation. Retrieved January 19, 2019. ^ a b Garofalo, Alex (June 1, 2016). "'American Ninja Warrior' Season 8's Biggest Obstacle: Compensation For The Athletes". International Business Times. Retrieved January 21, 2019. ^ a b c O'Hare, Kate (August 17, 2011). "'American Ninja Warrior' storms Japan's Mount Midoriyama". The Baltimore Sun. Retrieved January 21, 2019. ^ a b c Nordyke, Kimberly (July 1, 2013). "'American Ninja Warrior' EP 'Hopeful' This Season Will Produce First Winner (Video)". The Hollywood Reporter. Retrieved January 26, 2019. ^ a b c d e Johnson, Lottie Peterson (September 11, 2018). "2 Utahns come up short on 'American Ninja Warrior' finale — but at least this time they had a shot at a prize". Deseret News. Retrieved February 12, 2019. ^ a b Johnson, Lottie Peterson (September 19, 2017). "Season 9 of 'American Ninja Warrior' concludes with no winner — as usual". Deseret News. Retrieved February 12, 2019. ^ Hill, Kelly (July 27, 2013). "'American Ninja Warrior' contestant to host fitness camp in Rockford". MLive.com. Advance Publications. Retrieved February 12, 2019. ^ "(#416-120) FINALS". The Futon Critic. Retrieved January 25, 2019. ^ "G4 Heads to Japan for Third Season of "American Ninja Warrior" and Gives Fans the Opportunity to Support the Country's Relief Efforts Through the American Red Cross". The Futon Critic. April 28, 2011. Retrieved January 19, 2019. ^ a b c "G4 and NBC Partner to Broadcast the New Season of "American Ninja Warrior" The World's Most Difficult and Action-Packed Obstacle Course Competition Series Airing Weekly This Summer". The Futon Critic. January 24, 2012. Retrieved January 19, 2019. ^ a b c d e f g "American Ninja Warrior - Listings". The Futon Critic. Retrieved January 25, 2019. ^ Levin, Gary (June 30, 2013). "'American Ninja Warrior' begins a new course". USA Today. Retrieved February 1, 2019. ^ Iannetta, Jessica (July 18, 2014). "'American Ninja' star Kacy Catanzaro of N.J.: 'I didn't realize how many other people would care'". NJ.com. Advance Publications. Retrieved February 1, 2019. ^ Garofalo, Alex (November 14, 2014). "Is 'American Ninja Warrior' A Sport? Weatherman Joe Moravsky Trains For Season 7 Amid Questions Of Sponsorship And Getting Paid". International Business Times. Retrieved February 1, 2019. ^ "NBC's "American Ninja Warrior" Shows Its Strength with Fifth-Season Renewal". The Futon Critic. August 13, 2015. Retrieved January 19, 2019. ^ Anderson, Jon R. (September 15, 2015). "Military 'Ninja' hopefuls fall to Mount Midoriyama". militarytimes.com. Sightline Media Group. Retrieved February 1, 2019. ^ Moye, David (September 22, 2015). "NinjaGate: Who Is The True 'American Ninja Warrior'?". HuffPost. Retrieved February 1, 2019. ^ a b Lee, Nikki (September 15, 2017). "First Look: Allyssa Beird's Stage Two run". American Ninja Warrior Nation. SB Nation. Retrieved February 12, 2019. ^ Barnes, Katie (September 13, 2016). "This season of 'American Ninja Warrior' was a game-changer for women". ESPN. Retrieved February 12, 2019. ^ Lee, Nikki (September 10, 2018). "National Finals finale recap: Season 10 closes with monster courses". American Ninja Warrior Nation. SB Nation. Retrieved February 13, 2019. ^ Ninja Warrior [@ninjawarrior] (March 5, 2019). "Are you ready to overcome the next big obstacle?" (Tweet). Retrieved March 5, 2019 – via Twitter. ^ "Chris Hardwick to Host "The Red Nose Day Special" as NBC Expands Celebration of Red Nose Day to 3-Hour Program Block May 25 with Top Stars". The Futon Critic. April 5, 2017. Retrieved January 19, 2019. ^ "Derek Hough, NE-YO, Nikki Bella and More Take on Obstacle Course on "Celebrity Ninja Warrior for Red Nose Day" to Raise Money For Charity". The Futon Critic. April 2, 2018. Retrieved January 19, 2019. ^ a b "American Ninja Warrior - Awards & Nominations". Academy of Television Arts & Sciences. Retrieved January 9, 2019. ^ "DGA Announces Nominees for Outstanding Directorial Achievement in Television, Commercials and Documentary for 2018". Directors Guild of America. January 7, 2019. Retrieved January 9, 2019. ^ "Kids' Choice Awards 2015: The Complete Winners List". The Hollywood Reporter. March 28, 2015. Retrieved January 9, 2019. ^ Vulpo, Mike (March 11, 2017). "Kids' Choice Awards 2017 Winners: The Complete List". E! Online. Retrieved January 9, 2019. ^ "2016 Winners and highlights". CBS News. January 6, 2016. Retrieved January 10, 2019. ^ "People's Choice Awards Nominees 2017 — Full List". Deadline. November 15, 2016. Retrieved January 10, 2019. ^ "2017 PGA Awards Winners". Producers Guild of America. Retrieved January 9, 2019. ^ "2018 PGA Awards Winners". Producers Guild of America. Retrieved January 9, 2019. ^ a b "Sunday's Cable Ratings: "True Blood" Still on Top for HBO". The Futon Critic. August 4, 2011. Retrieved August 6, 2018. ^ "Sunday's Cable Ratings: Season Highs for "Keeping Up With the Kardashians," "True Blood"". The Futon Critic. August 16, 2011. Retrieved August 6, 2018. ^ "Sunday's Cable Ratings: Spurs/Clippers Best "Thrones," "Kardashians"". The Futon Critic. May 22, 2012. Retrieved January 28, 2019. ^ a b c d "SpotVault - American Ninja Warrior (NBC) - Summer 2012". Spotted Ratings. May 23, 2012. Retrieved January 28, 2019. ^ a b c d e "SpotVault - American Ninja Warrior (NBC) - Summer 2013 Ratings". Spotted Ratings. July 4, 2013. Retrieved August 7, 2018. ^ a b c d e "American Ninja Warrior: Summer 2014 Ratings". TV Series Finale. September 16, 2014. Retrieved October 21, 2015. ^ a b c d e "American Ninja Warrior: Season Seven Ratings". TV Series Finale. September 8, 2015. Retrieved October 21, 2015. ^ a b c d e "American Ninja Warrior: Season Eight Ratings". TV Series Finale. September 13, 2015. Retrieved September 13, 2016. ^ a b c d e "American Ninja Warrior: Season Nine Ratings". TV Series Finale. September 19, 2017. Retrieved September 23, 2017. ^ a b c d e "American Ninja Warrior: Season 10 Ratings". TV Series Finale. September 11, 2018. Retrieved January 28, 2019. ^ "Competition series 'American Ninja Warrior' to make Canadian debut this summer on CTV". ctv.ca. 16 February 2019. ^ "Ninja Warrior". challenge.co.uk. Retrieved 16 February 2019. ^ User, Super. "Compulite - Ninja Israel; the most extreme challenge in the world lands in Israel, with a spectacular lighting rig controlled by Compulite Vectors". www.compulite.com. Retrieved 16 February 2019. ^ "Najbolji ninja ratnici". RTL (in Croatian). Retrieved 16 February 2019. ^ "Talpa Network". consent.talpanetwork.com. Retrieved 16 February 2019. ^ Watton, Neil (2019-03-19). "Take on the American Ninja Warrior: Challenge on Xbox One, PS4 and Nintendo Switch". TheXboxHub. Retrieved 2019-03-20. 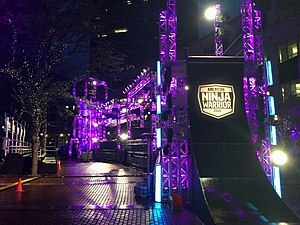 Wikimedia Commons has media related to American Ninja Warrior.